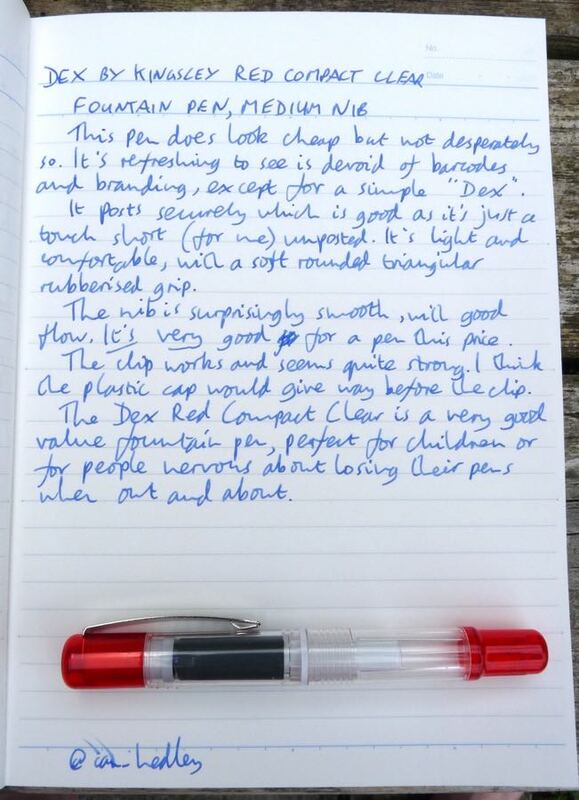 Dex Compact Clear Fountain Pen Review – Pens! Paper! Pencils! 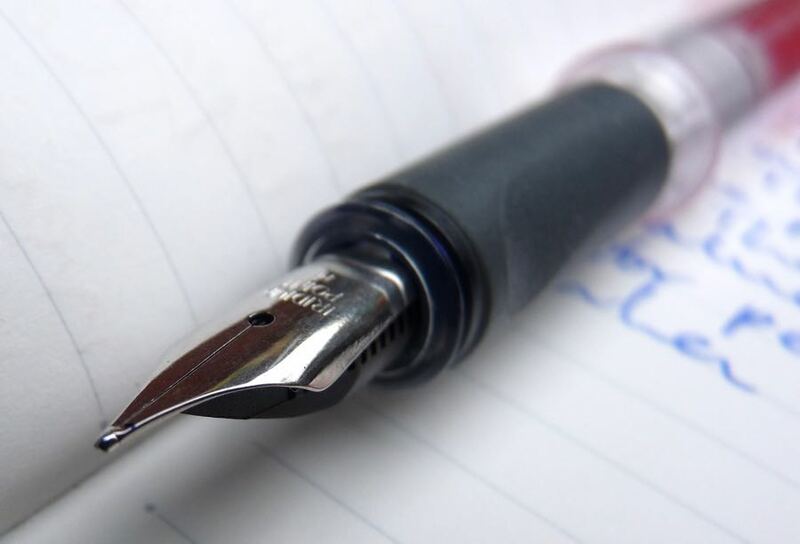 At Kingsley, we’re experts in designing, sourcing and producing a range of high quality, great value fashionable writing instruments and accessories that appeal to everyone. Thus this is a pen made by someone else (there’s some evidence to suggest by Diplomat) and branded by Kingsley. Is it any good? 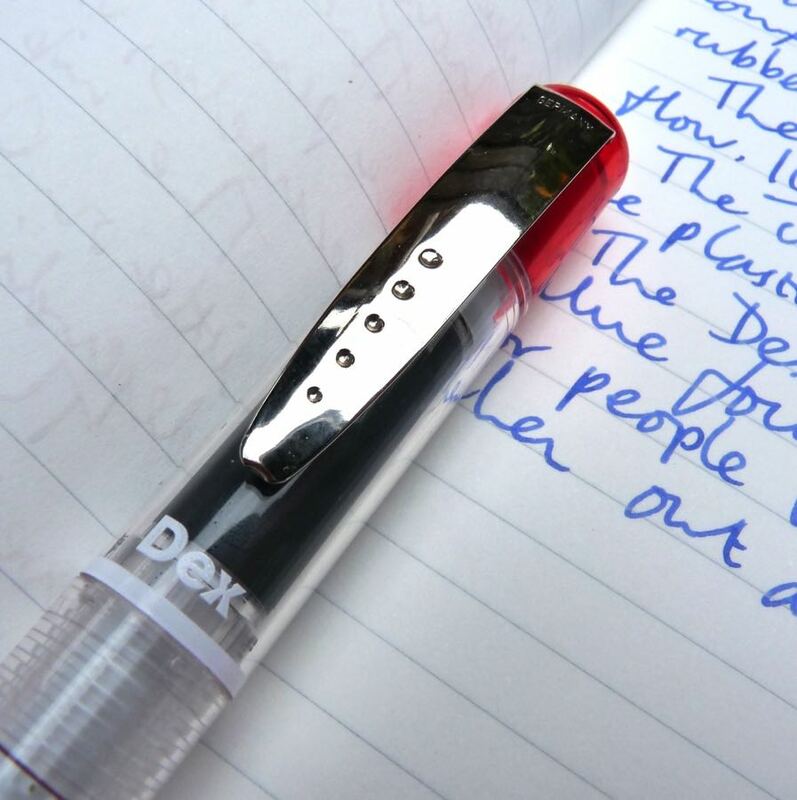 The Dex fountain pen is made from clear plastic with coloured cap and finial. It looks nice enough though it won’t fool anyone into thinking it’s a $100 pen. There is a simple ‘Dex’ printed on the cap and no other branding. It looks cheap but it doesn’t look tacky, unlike some other pens at this price point. The simple metal clip is reasonable and ought to last a long time if it’s not too roughly treated. The cap pushes on to close and to post. 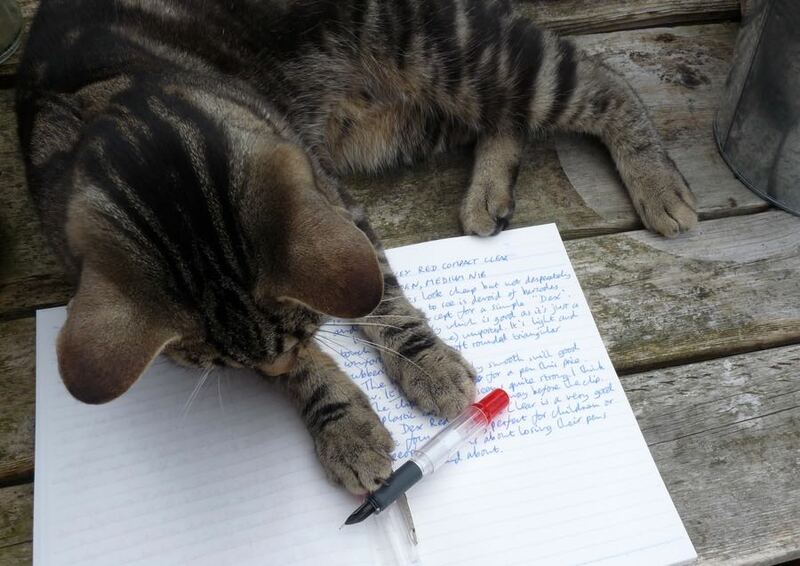 It’s a short pen unposted but fortunately the cap posts securely and the pen is nicely balanced either way. 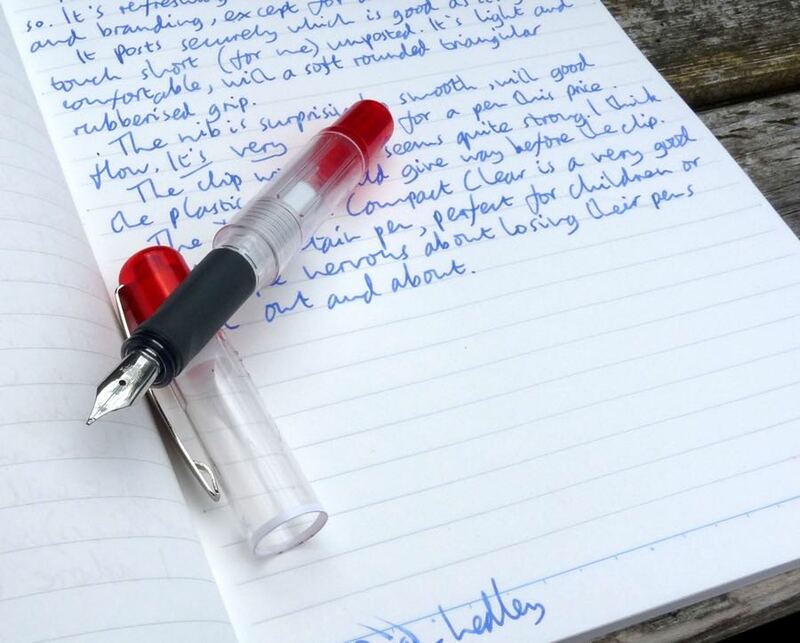 The nib (made by Bock), is only available in medium but it’s nice a smooth and writes well, with the feed supplying plenty of ink. The rubberised grip is gently shaped to help with your grip. It’s not as severe as a Lamy Safari’s grip and is comfortable to hold. This pen takes standard sized cartridges. I tried it with the anonymous blue cartridge it came with but a generic converter also fits. 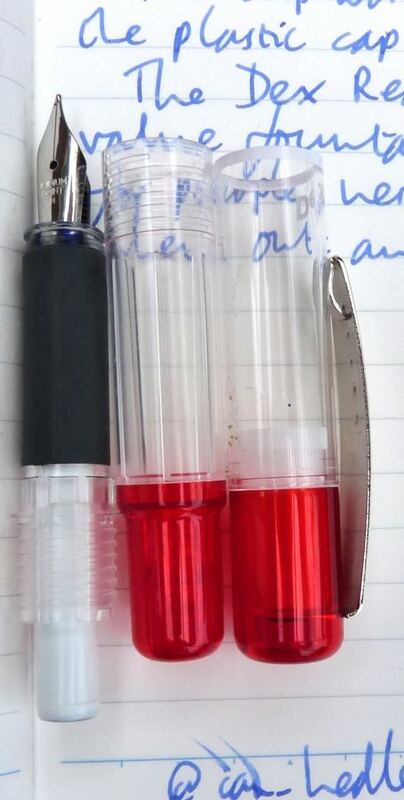 (I tried a Monteverde converter, which is a standard rebranded one (Kaweco’s are identical).) The included blue ink is a nice enough royal blue that dries fairly quickly. The Dex by Kingsley Compact Clear fountain pen, to give it its full name, a name that is longer than the actual pen, is a good little pen. I can see it appealing to children (it caught the eye of my eight-year old daughter) but it would also be a good pen to throw in a bag or pocket if you’re heading out and don’t want to take something too precious. Thank you to Yannis for helping me with these photos and not batting the pen away too often. This is part of a United Inkdom meta-review. 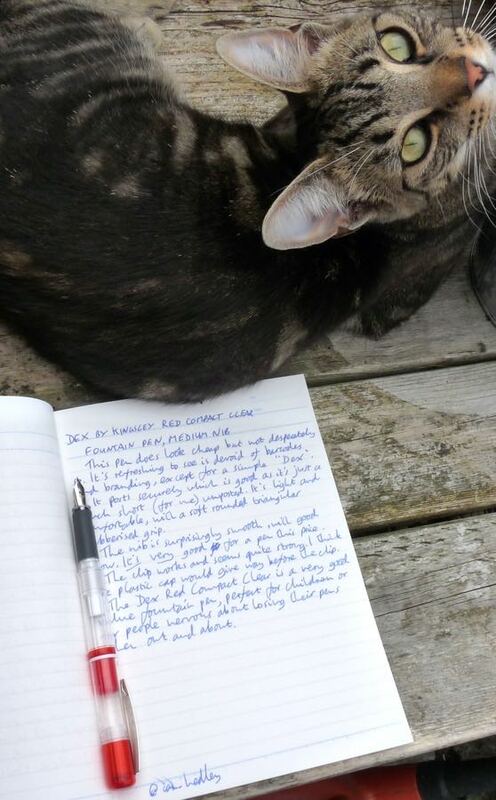 Head over there to read what Scribble and Ruth think of it and find not only links to their own reviews (handwritten and video) but also a special discount code. Thank you to The Pen Shop for sending me this pen to review. These are my own opinions. 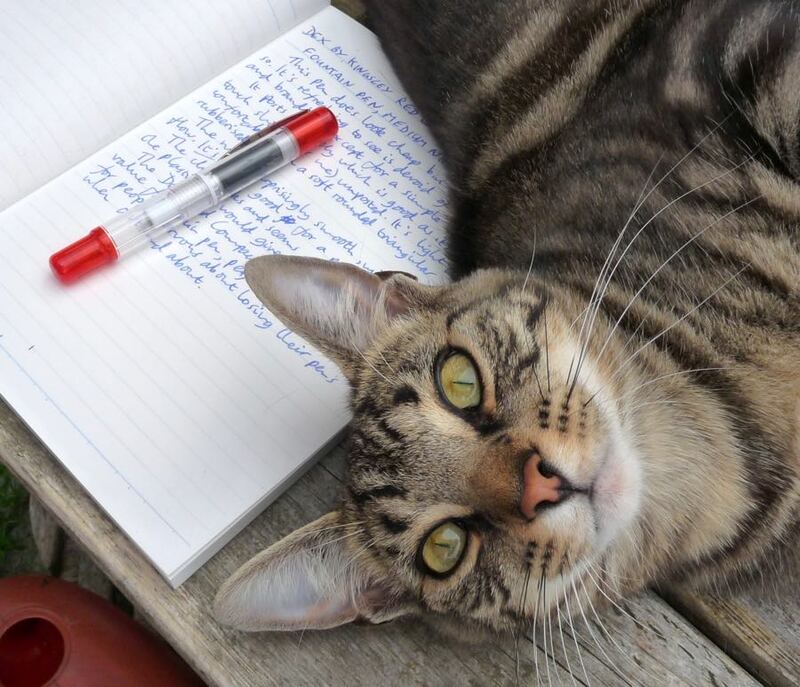 You have a terrific review assistant. Sure knows how to show off the product.